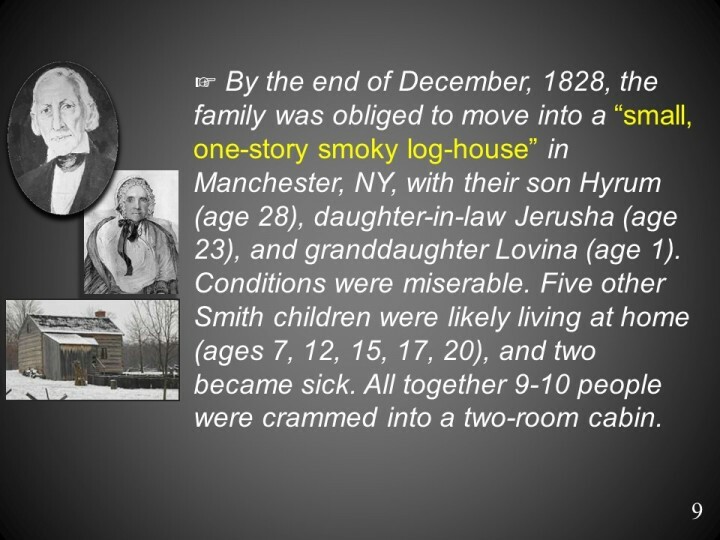 Smith family financial situation: In 1823, work on a frame house at the Smith family farm was halted by the unexpected death of Smith’s eldest son, Alvin. Smith subsequently failed to make payments on the farm. Reference: Hill, Donna (1977). Joseph Smith, the First Mormon. Garden City, N.Y.: Doubleday. p. xii. ISBN 0-385-00804-X. Ages in late Dec 1828: Joseph Sr, born July 12, 1771 age 57; Lucy, born January 24, 1775, age 53; Hyrum, born February 9, 1800, age 28; Sophronia (married, not living with parents) May 17, 1803, age 25; Joseph, jr. (married, not living with parents), born December 23, 1805, age 25; Jerusha (wife of Hyrum), born Feb 15, 1805 age 23; Lovina (daughter of Jerusha, born Sept 16, 1827 age 1; Samuel (“Sam” or “Harrison”), born March 13, 1808, age 20; William (“Bill”), born March 13, 1811, age 17; Catherine, born July 28, 1813, age15; Don Carlos (“Carlos”), born March 25, 1816, age 12; Lucy, born July 18, 1821, age 7.